So, hey there. We're sick AGAIN...or still, depending on how you look at it. Since I'm finding it difficult to type out something that makes sense in the midst of the coughing fits and feeling sorry for myself, I'm here to show you other people who are doing really cool stuff that you should totally know about. First, my favorite girls over at Mom Generations have launched their "12 Days of Must-Have Holiday Gifts" and you don't want to miss it. 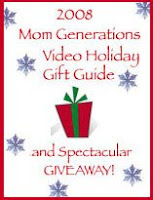 They are showing you the best of the best gifts for kids, moms and everyone on your list. Even better? They are giving you all the chance to win the gifts they are telling you about! Today's gifts are for kids and the prize package is worth almost $300! Seriously, check it out by clicking the button below and don't forget to tell them how beautiful they are because, seriously? Those ladies are the bees knees. I have no idea what that phrase means but they are awesome and I've always wanted to use it so...just check them out! I can't tell you how many people ask me about my blog designs both here and over at From Grey to Green. Beth from Ruby & Roja is this amazing woman who can do everything. She is seriously the best designer out there and just started a photography business, too. She's amazing. She's also doing an amazing giveaway right now that you won't want to miss if you have a blog. The 2 winners will receive a holiday blog makeover AND a whole year's worth of blog designing for free. This is an awesome giveaway and you don't want to miss it!